"ALWAYS RED" by Elizabeth Arden is bright and intense in sound, fragrance, which definitely, won't leave you unnoticed. This scent is so alluring, that it literally "screams" character, leadership, passion and style. 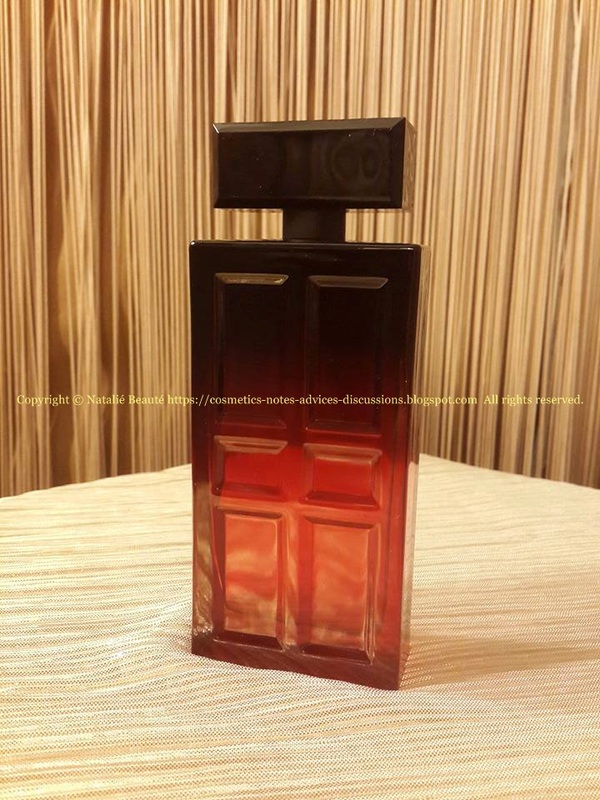 "An alluringly luxurious floriental fragrance made for the leader of the "in" crowd." 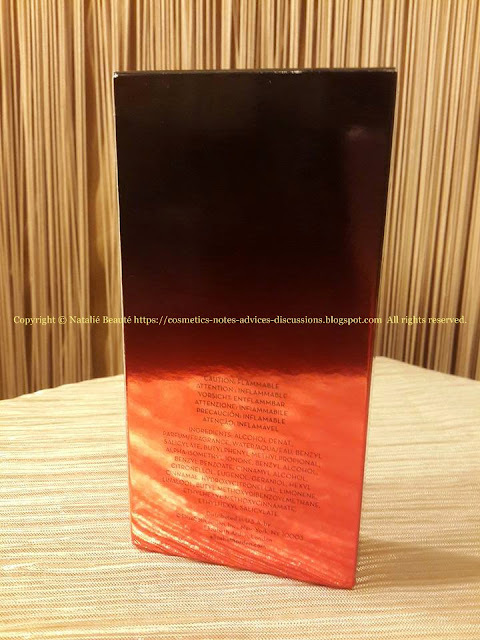 This interesting fragrance is so alluring, that it penetrates the air around you and creates bright vibrant aura. It's vividly shining and if you are going somewhere, where you want to take the attention, wear it! 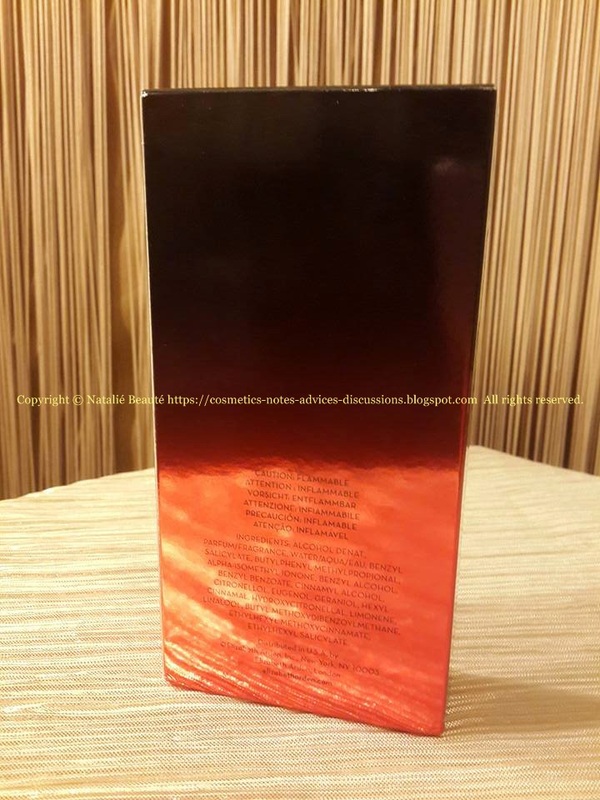 It has also very strong sillage and it's long lasting. 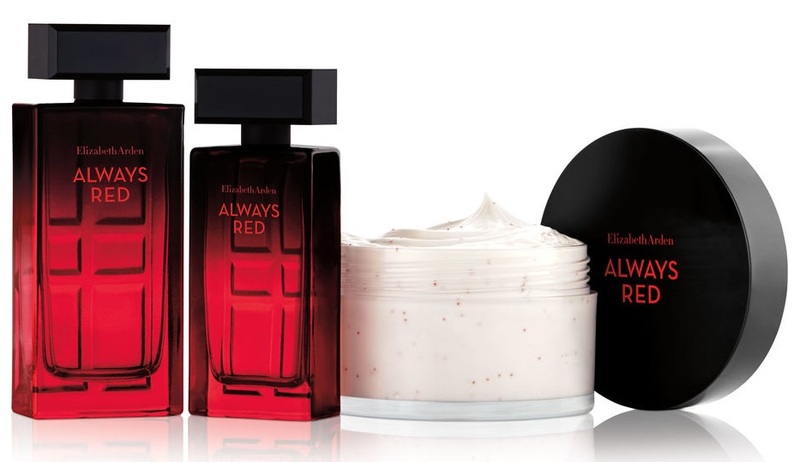 It's incredible for fragrance in EDT concentration. 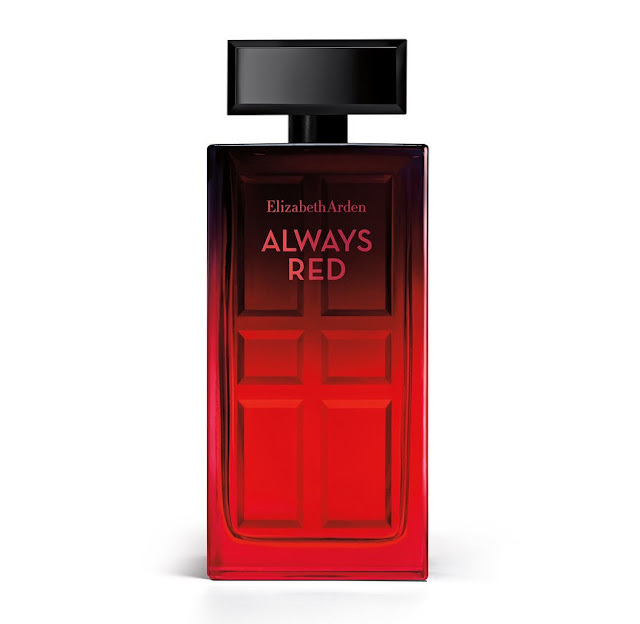 Also, "ALWAYS RED" is highly awakening the senses, scent. 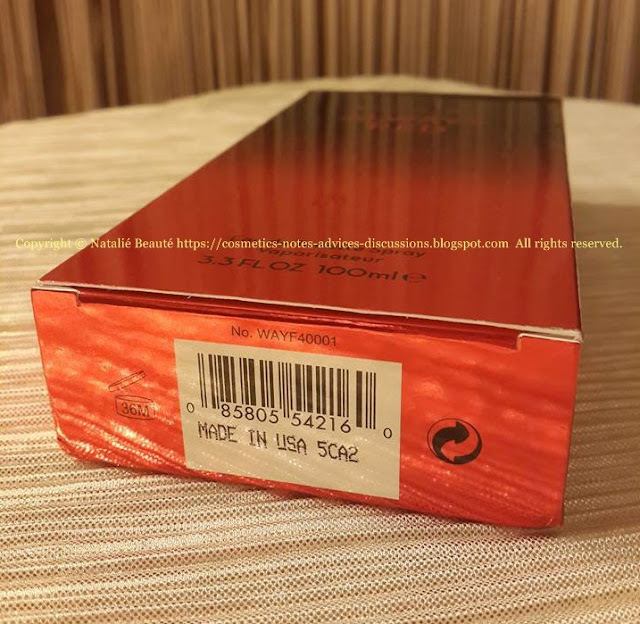 It's launched in the Summer of 2015 and the same year, it wins several awards - some of them are Women's Fragrance USA 2015, Fragrance USA 2015. 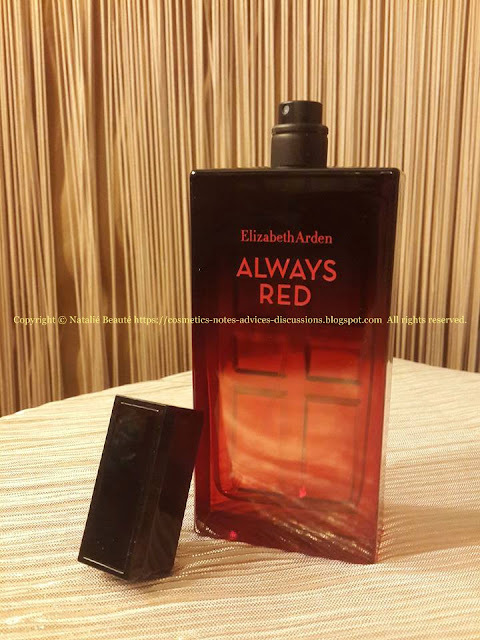 "Elizabeth Arden ALWAYS RED. 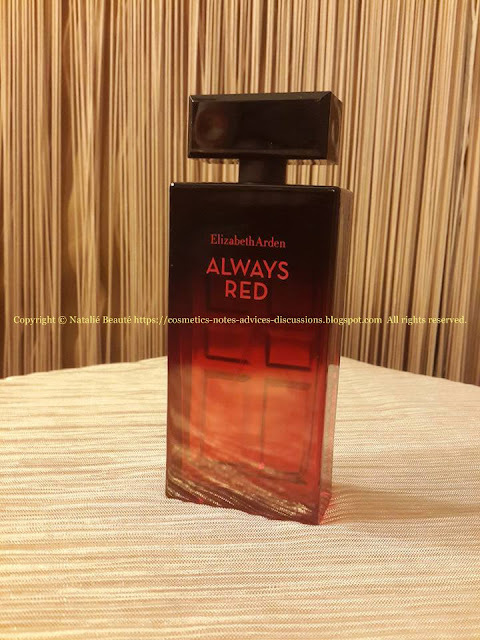 A daring fragrance by Elizabeth Arden. Bright accents of red plum, blood orange, and passionfruit lead to a textured floral heart of Jasmine Sambac, pink freesia and velvet rose petals. The sophisticated dry down of enveloping praline, cashmere woods, and amber is the final touch of this Luxurious Floriental signature." 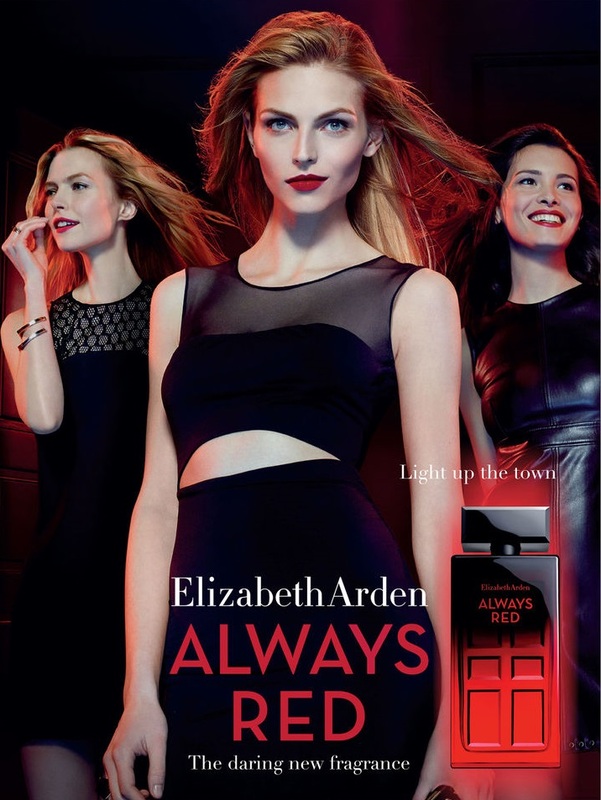 How do I feel this perfume composition and how it reveals? They are always emerging in tandems - Praline-Plum and Rose-Jasmine Sambac. The most dominant category is the Tasty - Praline, Red Plum. And somewhere there, under these yummy notes, is sharply emerging the sharp, loud Rose, accompanied by Jasmine Sambac. The senses are crazily jumping between both groups. "ALWAYS RED" is very sweet, very tempting, very sensuously delicious scent. 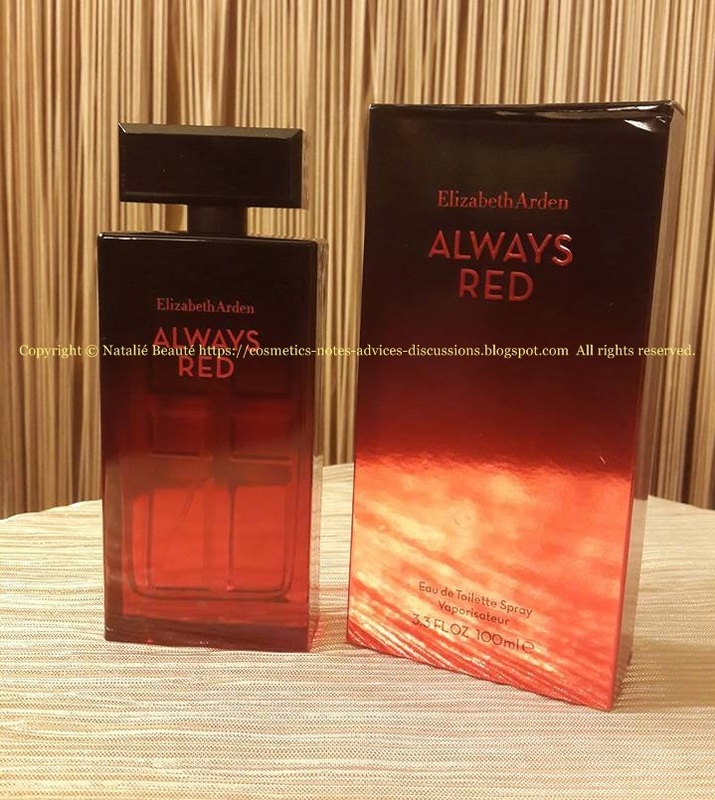 Definitely, it's a fragrance for the lovers of this type of scents. It's not everyone's cup of tea! 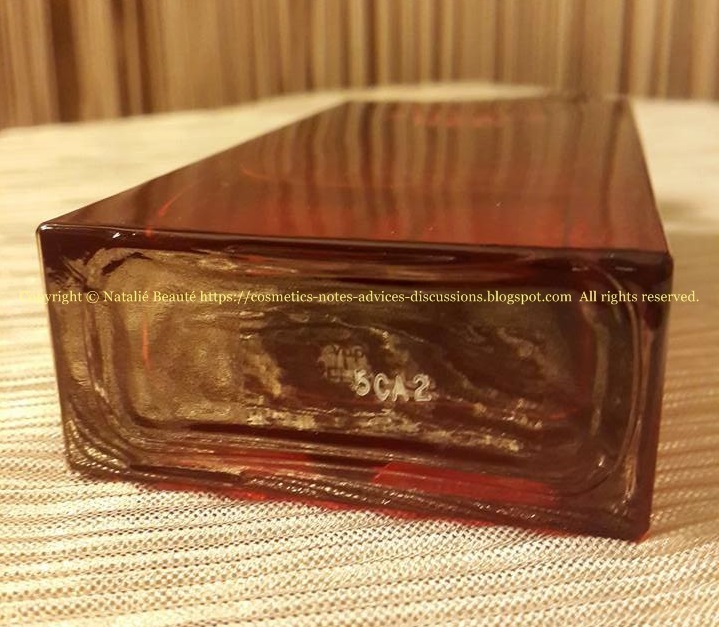 All these intense notes are making this fragrance very rich and saturated. As every other fragrance, this one also opens in different way on the different people skin. It also changes in the different temperature and environmental changes - in cold, it the sharp Rose "cuts" the sweetness of the Praline. 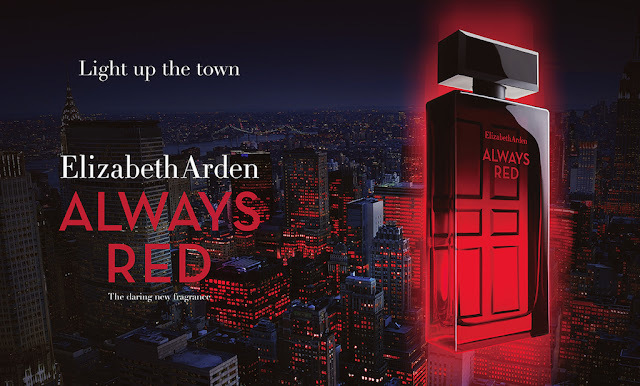 It's the main fragrance from the Always Red Line. 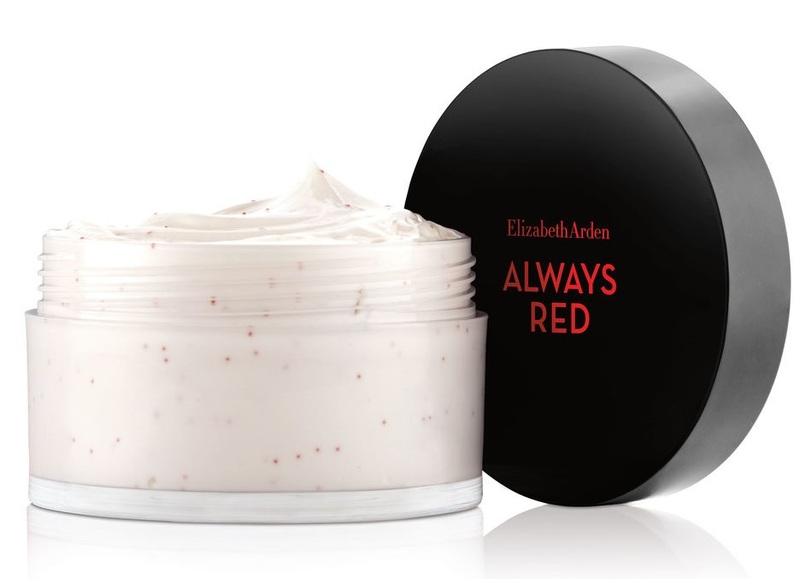 You can find it also as Red Drops Souffle with red pearls. and caresses skin all over." 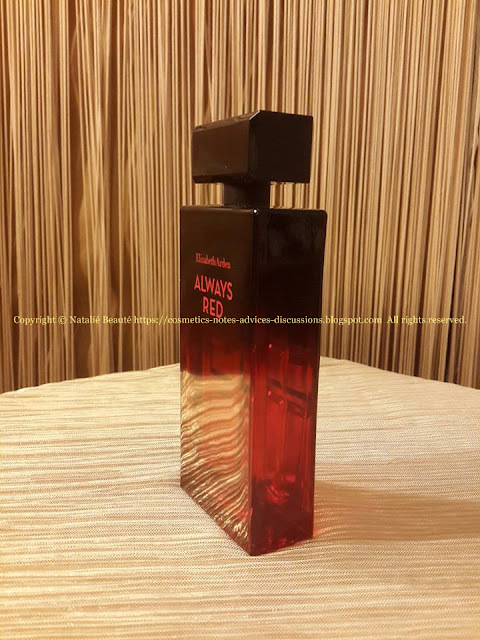 The product comes in massive transparent glass bottle, colored in red-black, from down to up, shaped as block and as door - on back side, plastic cap, with black glass part on the top, EDT. Available in 50 ml, 100 ml. It is in paper box, wrapped in nylon. 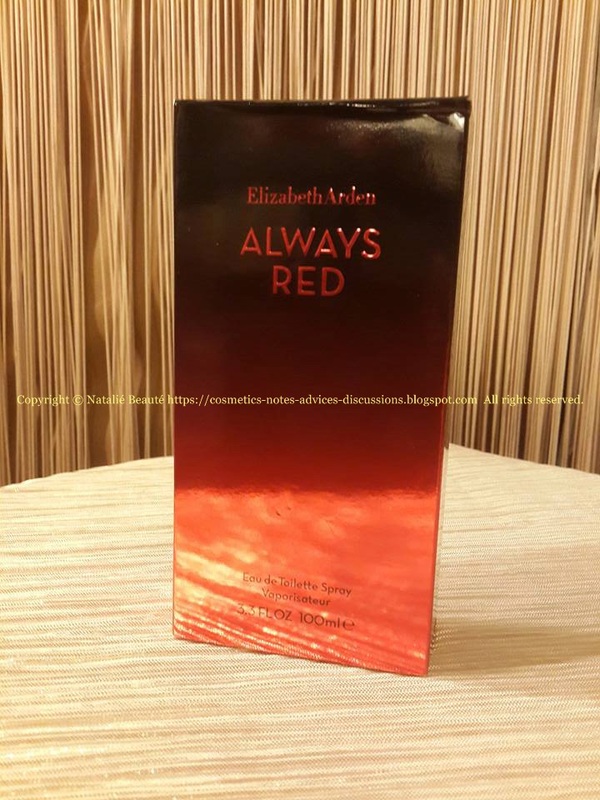 "ALWAYS RED" by Elizabeth Arden is bright, very sweet, yummy, saturated and very passionate fragrance, but there isn't depth as in classic or vintage fragrance. So, it can't easily become favorite to the appreciators of these two category of fragrances. Because of its specificity, it's not every day or every night scent. It can be weared in special events or moments. Because of its intensity and brightness, I recommend to wear it after you spray cloud in the air and go through. Applied directly on your skin, it can cause you discomfort. Applied on your clothes (from distance, of course), it stay more, than one day. Don't wear it in restaurants, hospitals, in the presence of children.